Just Dance 4 é o seu bilhete para a melhor música nova com mais de 40 faixas de uma variedade de artistas de topo, gêneros populares e canções Billboard Hot como “Feeling Good”, de Flo Rida , e se move como Jagger Maroon 5 pés por Christina Aguilera. A lista de faixas também apresenta artistas lendários, como Barry White e The B-52 para obter a família inteira se e mover-se. Just Dance 4 é o catalisador perfeito para as melhores festas, não importa o que a ocasião, graças aos modos inovadores como o todo- novo modo de batalha, um modo atualizado Apenas suor, e ainda mais diversão, danças alternativas. 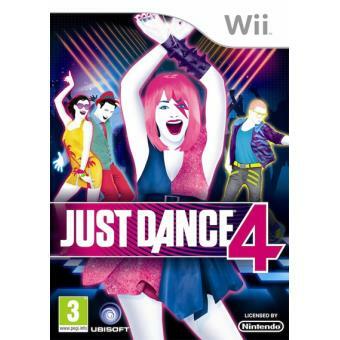 Tudo o que você sabe e ama sobre Just Dance fica ainda melhor com Just Dance 4-quentes novas faixas, divertidas danças irreverentes e muito mais. - Bill Medley & Jennifer Warnes - "(I've Had) The Time of My Life"
- Las Ketchup - "Asereje (The Ketchup Song)"
- Justin Bieber feat. Nicki Minaj - "Beauty and a Beat"
- Panjabi MC - "Beware Of The Boys (Mundian To Bach Ke)"
- Carly Rae Jepsen - "Call Me Maybe"
- Boys Town Gang - "Can't Take My Eyes Off You"
- Army of Lovers - "Crucified"
- Dancing Bros. - "Everybody Needs Somebody To Love"
- Flo Rida - "Good Feeling"
- Blu Cantrell - "Hit 'Em Up Style (Oops!)" - A.K.A - "Hot For Me"
- The Blackout Allstars - "I Like It"
- They Might Be Giants - "Istanbul"
- Elvis Presley - "Jailhouse Rock"
- Ricky Martin - "Livin' la Vida Loca"
- Selena Gomez and the Scene - "Love You Like A Love Song"
- Nelly Furtado - "Maneater"
- Sergio Mendes ft. The Black Eyed Peas - "Mas Que Nada"
- Maroon 5 ft. Christina Aguilera - "Moves Like Jagger"
- Alexandra Stan - "Mr. Saxobeat"
- Rick Astley - "Never Gonna Give You Up"
- Marina and The Diamonds - "Oh No!" - Jennifer Lopez ft. Pitbull - "On The Floor"
- The Girly Team - "Oops!… I Did It Again"
- The B-52's - "Rock Lobster"
- Skrillex - "Rock N'Roll (Will Take You To The Mountain)"
- Kat DeLuna ft. Busta Rhymes - "Run The Show"
- Anja - "Crazy Little Thing"
- P!nk - "So What"
- Sammy - "Some Catchin' Up To Do"
- Nicki Minaj - "Super Bass"
- Stevie Wonder - "Superstition"
- Europe - "The Final Countdown"
- Halloween Thrills - "Time Warp"
- 2 Unlimited - "Tribal Dance"
- Rihanna ft. JAY-Z - "Umbrella"
- Hit The Electro Beat - "We No Speak Americano"
- One Direction - "What Makes You Beautiful"
- Will Smith - "Wild Wild West"
- Barry White - "You're The First, The Last, My Everything"